Get those swords out, its time for another Game Train Episode! This time Callan takes on the challenge of Sekiro: Shadows Die Twice while Karl ops for easy mode in his review of Yoshis Crafted World. On top of this massive double review episode, the guys look at the new content in the Division 2, talk through the latest gaming news including the Borderlands 3 announcement and as always give their Hype, Love and Lame Trains! Come jump on board the Game Train! Toot toot! Some big games discuss on the podcast this week, kicking off with the ultra hard Sekiro: Shadows Die Twice, the great looter shooter The Division 2, the Challenging Rally game Dirt: 2.0 and of course we review the super slick and stylish Devil May Cry 5! Also Callan and Karl answer your questions and playtest each some of each others retro faves in the new segment Classic me Classic you! 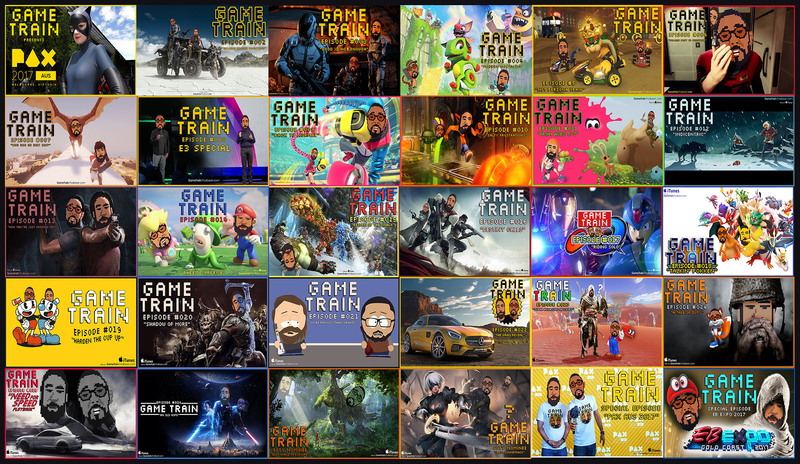 All this and more on episode 58 of Game Train! Karl Smith is joined this episode by guest co-host, Connor Skinner-Smith. The boys talk all things Anthem, and try to figure out what is going on with the baffling public opinion. They get right into Ubisoft's Trials Rising and Far Cry New dawn. They speculate on Pokemon Sword and Pokemon Shield, look a little more into Tetris 99 and so much more, including the always present lame/love/hype trains. Passengers, come join us for a ride aboard episode 57 of the Game Train! The wait is finally over, Kingdom Hearts 3 has arrived but does it live up to the hype? Also, Callan and Karl channel Mr Terry Crews and jump into Crackdown 3, is this the exclusive that Xbox has been after? Plus the new battle royale, Apex Legends, the guys go over the massive Nintendo Direct that just dropped including Karls reacting to a battle royale puzzler Tetris 99! Come get on board! Dan Simmons, a video game collector arrives on The Platform this week to discuss how he amassed his collection of over 2000 games, rare collectables, how he felt about selling the collection and gives his opinion on how retro game collecting has changed over the years! Welcome to episode 55! With Callan on holiday, Karl rides solo for this episode and dives into the eagerly anticipated Resident Evil 2 Remake! Jump aboard the Game Train and come hang out for a bit! On the first episode of this new series, Callan is joined on The Platform by former Sega Ozisoft employee Tim Gadler, who tells of his time at the company writing reviews, walkthroughs and answering the Sega Hotline back in the early 90's! Come get on board our new venture! Everyone is here including Callan and Karl as they go head to head over Super Smash Brothers Ultimate on the Switch! Also, they don their cowboy hats once again as they head back to New Austin in Red Dead Redemption 2 Online, Karl tries his hand at Beat Saber on PSVR and the guys discuss their favourite ever Xbox One Title, all this and more on episode 52 of the Game Train!